FILE - Chief of Staff of the Free Syrian Army Gen. Salim Idris addresses the media after he discussed the situation in Syria with the leader of the Group of the Alliance of Liberals and Democrats for Europe Guy Verhofstadt, right, at the European Parliament in Brussels, March 6, 2013. Washington's decision to dispatch U.S. commandos to northern Syria to help coordinate the fight against the Islamic State terror group is roiling increasingly tense relations between the Obama administration and the main Western-backed Syrian political opposition, as well as Sunni Arab rebels whose priority is to oust Syrian President Bashar al-Assad. Rebel commanders with the Free Syrian Army say they were not informed of the decision to send the U.S. military into northern Syria. They learned of the plans from reporters after the White House announced that a small group of special forces — fewer than 50 — would deploy to Syria coordinate anti-IS operations by mainly Kurdish fighters and by the U.S.-led coalition supporting the rebels. FILE - U.S. special forces soldiers. at being left in the dark about the deployment, FSA rebel commanders complain the United States appears determined to build up the capacity of the Kurdish People's Protection Units, or YPG, and a smaller alliance of disparate Arab and Turkmen militias based in northeast Syria, while neglecting rebel forces west of the Euphrates. Since Russia launched its air campaign mainly against anti-Assad rebels, arms supplies to the FSA have increased from the United States and other countries known collectively as the "Friends of Syria." Chief among the arms supplies is anti-tank TOW missiles. But FSA commanders complain the resupplies are insufficient in the face of Russian-backed Assad ground offensives, and they continue to voice deep resentment toward Washington for refusing to supply shoulder-launched anti-aircraft missiles known as MANPADS. And the support for the YPG is increasingly frustrating FSA commanders and politicians in the Syrian National Coalition, who fear the territorial ambitions of pro-separatist Kurds. 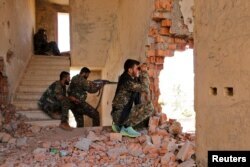 FILE - Kurdish People's Protection Units (YPG) fighters take up positions inside a damaged building in al-Vilat al-Homor neighborhood in Hasaka city, as they monitor the movements of Islamic State fighters stationed in Ghwayran neighborhood. Just hours before the White House announcement Friday, SNC vice president Nagham al-Ghadri complained of the U.S. strategy on Syria and lamented Washington's backing for the Kurdish YPG, the armed offshoot of the Democratic Union Party (PYD). “They give full support to the PYD," al-Ghadri said in an exclusive interview with VOA. "We have spoken to the Americans about it many times." She described the PYD as "a tool of the Assad regime in Kurdish areas” of Syria. FSA rebel commanders argue the YPG does not fight Assad’s forces, apart from an occasional skirmish when local disputes flare between the two. “From the beginning of the revolution until now, there is always an excuse why the U.S. is not supporting us more,” al-Ghadri said. U.S. military officials say the YPG is the coalition’s most capable partner on the ground in the struggle against Islamic State militants. But FSA and Islamist rebel brigades harbor a deep overall suspicion of those Kurdish fighters, who have as their overarching objective to establish some kind of autonomous or semi-autonomous Kurdish state in northeast Syria. Adding to the suspicions is a recent report by Amnesty International accusing Kurdish militias of forced displacement of Arabs and Turkmen from territory they have captured in recent weeks, and of mass house demolitions in non-Kurdish villages. PYD and YPG officials vehemently deny the rights group’s allegations. Turkish officials also have expressed disapproval of Washington’s burgeoning support for the YPG, which is an offshoot of Turkey’s outlawed Kurdistan Workers’ Party, the PKK. Ankara fears territorial gains by the Syrian Kurdish militia along its borders will fuel the ambitions of separatist Kurds in Turkey. A cease-fire between Ankara and the PKK collapsed in July, triggering a resumption of hostilities in the decades-long struggle in Turkey between ethnic Kurds and Turks. Earlier this month, Turkish Prime Minister Ahmet Davutoğlu warned the U.S. publicly against arming the Syrian Kurds, declaring such a move would threaten Turkey's security. A key Ankara demand is that the YPG and associated armed groups do not cross west of the Euphrates River to establish contiguous Kurdish-controlled territory along a large stretch of the 900-kilometer Syrian-Turkish border, from Iraq in the East to the mainly Kurdish town of Afrin. Washington has struggled for months to square the circle between Ankara and the YPG. On Wednesday, President Barack Obama’s special envoy, General John Allen, told a U.S. Senate panel that maintaining support for the PYD and its armed wing the YPG in Syria while cooperating with Ankara is one of the most complex challenges facing Washington. So far, there has been no official Turkish response to Friday’s announcement of the deployment of U.S. special forces — the first time Washington has put boots on the ground in Syria for anything but a defined raid. But a senior Turkish official said Ankara is demanding more detail from Washington about exactly where the U.S. commandos would be based and what their function would be. Turkish Prime Minister Davutoğlu said last Monday that Turkey has struck Kurdish militia fighters in Syria twice after they defied Ankara's warning not to cross the Euphrates. “We have said, the PYD must not cross west of the Euphrates,"Davutoğlu told a local TV news channel. "We will hit them the moment they do, and we have struck them twice" already. He did not explain where or when those incidents took place. Is US Plan for More Anti-IS Raids Mission Creep?